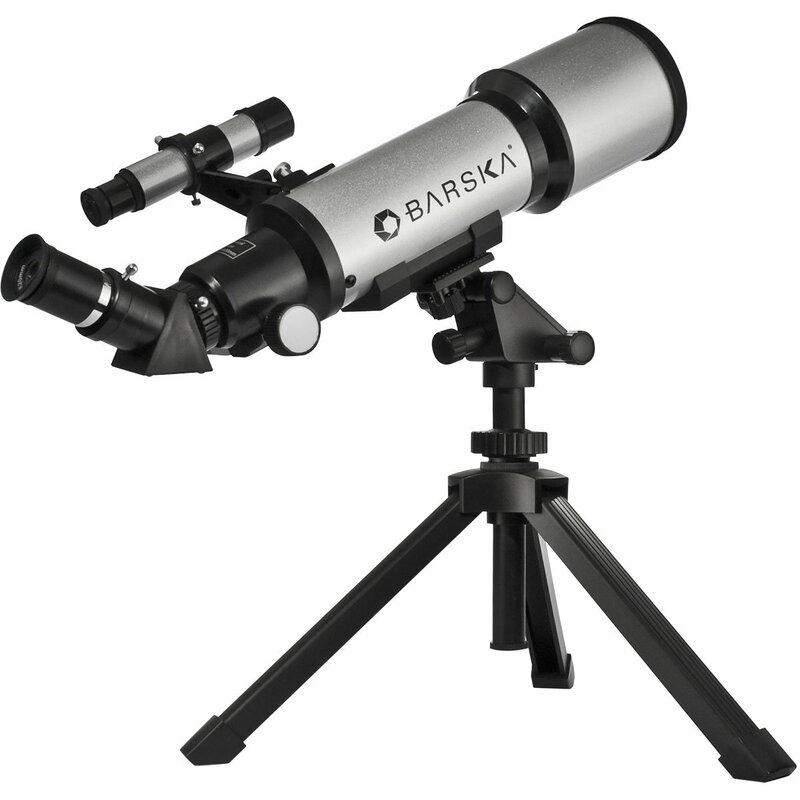 The Barska 40070 Starwatcher Compact Refractor Telescope with Table Top Tripod and Carrying Case is an ideal telescope for the aspiring amateur astronomer. Ideal for students or those interested in learning more about the night sky, the 70mm objective lens can zoom up to 300x power. Use one of the interchangeable eyepieces with a 3x power Barlow lens for increased viewing capability. A pan-head mount and tripod is included with the telescope along with a handy carrying case. Take this portable telescope outdoors at night and the stars will open up before your eyes. I purchased this scope based on positive reviews on a couple of web sites that cater to amateur astronomers. I wasn’t disappointed. A couple of things prevented me from rating it a 5. The 45-degree diagonal and the tabletop tripod are better suited to terrestrial viewing. If you plan on astronomical use you’ll want to use a full-sized tripod and add a 90-degree diagonal at some point if you don’t already have one. Also, a 2x barlow lens would have made much more sense than the 3x. On the plus side the scope is sturdily constructed and has good optics for the price. I live in the heart of St. Louis and haven’t been able to take it to a dark viewing area yet, but from my backyard the moon was excellent as was the Orion nebula, and Mars presented a nice sharp disk. The stock eyepieces are fine, but using a 9.7mm super plossl the results were great! I purchased this telescope with a specific purpose in mind. My office overlooks a golf course where a PGA event is held. I bought this and a USB camera eyepiece, to watch the golf tournament on my laptop. Worked great and I was able to accomplish my goal for under $100. This is a great inexpensive telescope that would be suitable as a starter or 1st telescope, worked well for the purpose I got it for. This telepscope is a very good telescope.very powerful and clear.easy to use even for a beginner.the only complaint may be the tripod is small and you need to have a sturdy base to set it on for it is too small to use by itself.but if you have a sturdy deck or outside patio or just happen to have a full sized tripod of your own this makes an excellent telescope for astronomers of all ages and skill levels. I think this is perhaps the best value for the money to be had in a small, short tube, inexpensive portable scope. Images are crisp and clear for both terrestrial and celestial viewing. The included 1.25″ lenses and 45 degree diagonal work well enough. One can, of course, use higher quality lenses and 90 degree diagonals for a better viewing experience. A big advantage of this scope is that the included tripod has fine motor controls for horizontal and vertical movement, making it much easier to track celestial objects as they move across the sky. It appears to be identical to the Celestron Tabletop Tripod that sells alone for $20.95 here on Amazon. It’s made of light plastic, but the controls work well enough. Most other short tube scopes in this price range that I’m aware of don’t have tripods with this capability. The Barska 40070 is definitely worth your consideration!